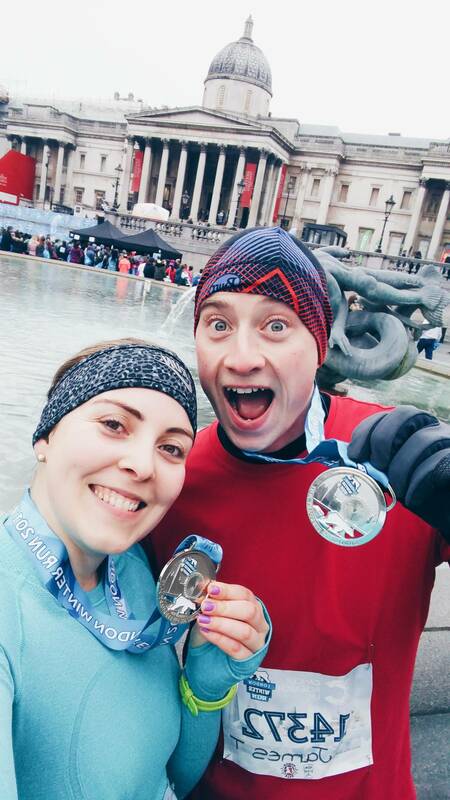 On Sunday I took to the streets of London with penguins, polar bears, huskies, oh and my boyfriend James, for the fantastic London Winter Run 10k! I’ve run this race for the last two years, and it’s always a great one to kick off the year and gives me an incentive to keep running through the cold dark months. This year I was lucky enough to have the motivation of the #TinyTYRunClub led by the lovely Elle from Keep It SimpElle every Thursday evening, which meant I was toeing the start line feeling a little more prepared. But for me the London Winter Run was always going to be about having fun! It was my first 10k with James, and a race with so many amazing photo opportunities that I couldn’t help stopping every so often, even if I hadn’t needed an excuse to take a break. 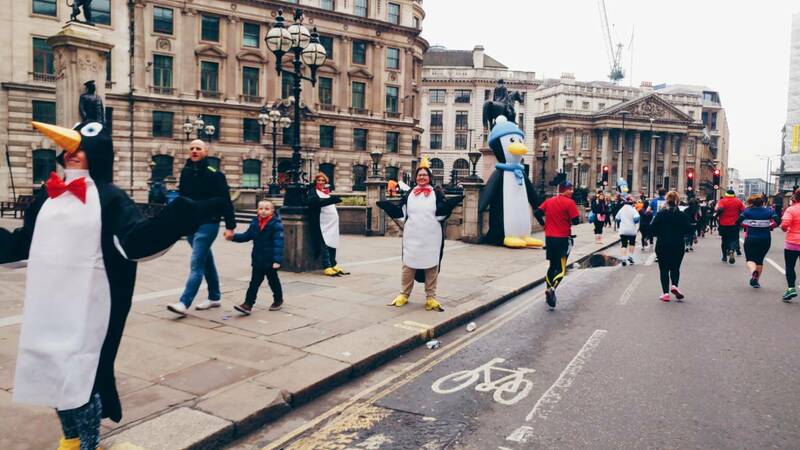 The course started at Trafalgar Square with a “Snow Blast-Off” and wound round the City streets, along the Strand, past the Penguin Party at Chancery Lane, and to St Paul’s Cathedral where the drinks station sat, at the halfway point. There were various wintery characters available for selfies including a rather scary looking husky/wolf! My favourite was definitely the St Bernard, especially when I was able to give a real one a hug at the finish line – Isabelle was huge, fluffy and gorgeous and I definitely wanted to take her home with me. We were treated to a band of drummers, a Rock Choir and gospel singers who helped add to the high energy fun atmosphere, as well as all the fabulously enthusiastic marshals whooping and cheering us along the route. The last couple of kilometres were back along the Strand the way we had come, and down to Whitehall. James grabbed my hand and pulled me down the finishing straight for a sprint finish – we had been following the same couple for most of the race, and he was determined to beat them! I’m definitely a fan of the competitive streak, although I’m also glad he decided to run with me, and stick to my pace for most of the distance. Races are more fun when you have people to take part with! As we crossed the line we were greeted with the highly anticipated Polar Bear hugs, and handed our medals, Vita Coco and Lindor chocolate bars – definitely one of the best things I’ve been given after a race! We walked back to Trafalgar Square to collect our bags (baggage drop was incredibly well organised) and take some photos with the London landmarks. Another piece of race bling to add to the collection and a reminder that running is about having fun as much as achieving extraordinary fitness feats. Did you race this weekend? What’s the most fun race you’ve taken part in? NB: I was given a complimentary race entry to the Human Race London Winter Run 10k. That looks like a really fun race, I would be dying laughing at everyone in costume. Also Lindt chocolate at the end?! Yes please! That dog is gorgeous! I did the winter run last year and I did enjoy it, although in no way did I want a hug off any of the people dressed as polar bears- their costumes were far too thin and it just made me think of the Pluto (or another character?) who was banned for groping- I ran it with a friend and we both agreed they were a bit creepy! The medal is so pretty too. 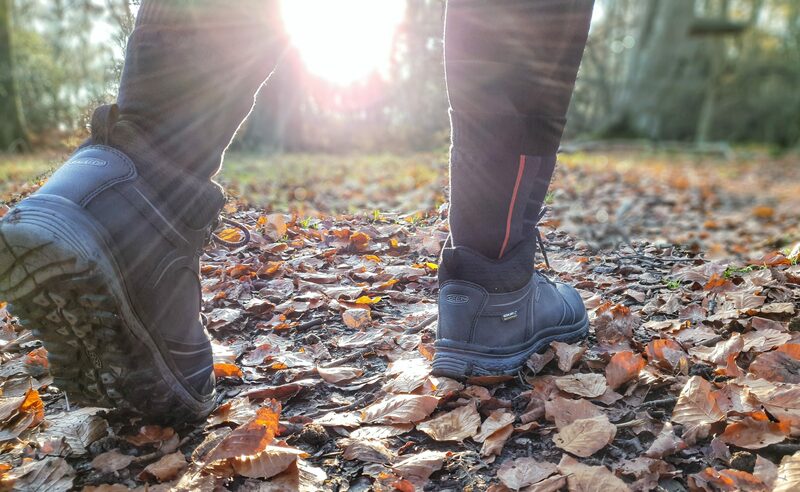 I did a run at Whipsnade park a few years ago and that was great as you could see the animals as you ran around, but they have not had it for the last couple of years. Ahhhh the dog is gorgeous! I love the whole theme of this race – the polar bears and atmosphere. It sounds brilliant. I think the most fun race I’ve done is one where you get a token for a beer and a cake afterwards. I love that race and try to do it every year. It’s very local and small but has such a good atmosphere. It looks like such a fun race, will definitely have to find something similar. It’s also good to have a focus through the winter. Great pics!